Dinner was going to be perfect. For once I had planned ahead of time, thought about every member of the family’s likes and dislikes, and had the perfect meal planned. I had pasta without sauce for my four-year-old, cheese ravioli for my vegetarian twelve-year-old, meat sauce for my husband, and zoodles for me. It was perfect. Something for everyone! I got the table set, everything was in its place. I set out the dinner and called my family to the table, ready to connect and enjoy my time with them. “Blech…. 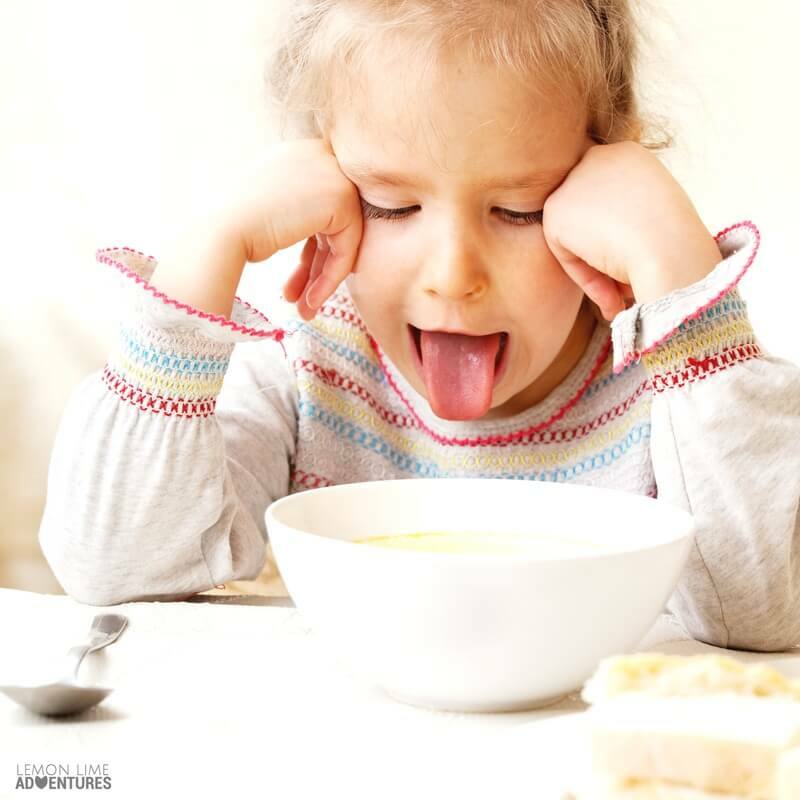 My taste buds don’t like it…” my-four-year old immediately (and loudly) shouts. “Nope, I still don’t like it,” she said with a frown on her face and her nose turned to the air. As she pushed the bowl away from her and pushed her chair away from the table, she crossed her arms and said “I’ll just have pb&j. That’ll be fine”. Why do meal times have to be so hard? 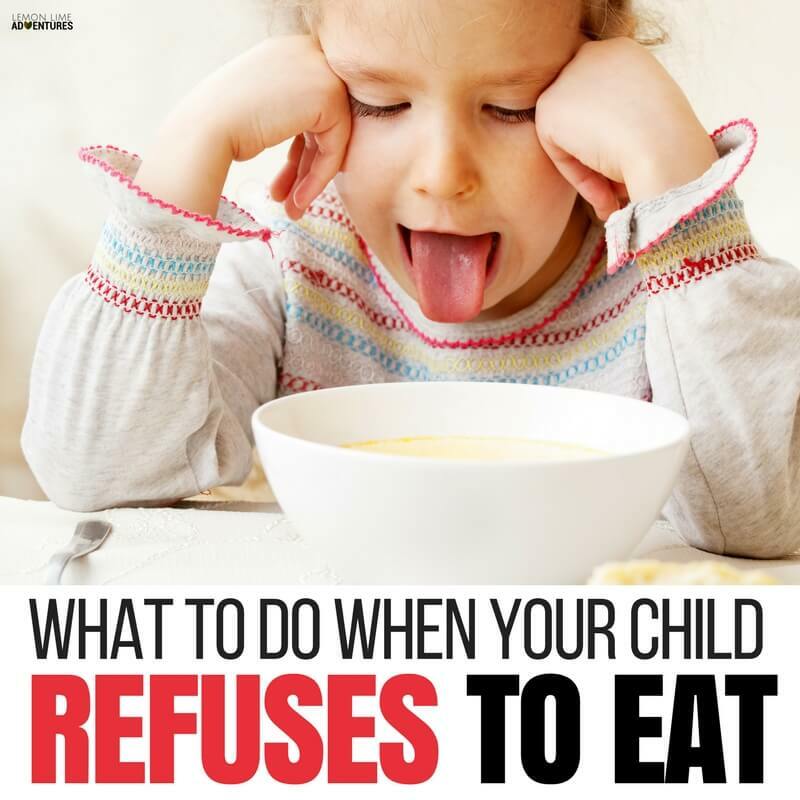 And why in the world does my child refuse to eat everything? Anytime I have food questions, I go to Alisha from Your Kid’s Table. I had her on my Facebook page the other day to talk to us about the real reason your kids refuse to eat. I am beyond excited! This is her area of expertise, so I’ll let her take it away! I’m kind of obsessed with all things eating. I’m a pediatric occupational therapist. I’m specialized in kids feeding, especially picky eating. Obviously, since I’m an OT, I have this huge love for sensory too. As we’re going to talk about in a second, there’s a huge overlap between the two. What I really wanted to do today was talk about something that a lot of people are not talking about. The sad truth is that most people just don’t know this information, even some professionals! They’ll be the first ones to tell you, by the way. I’m not trying to throw anyone under the bus, but our kids’ pediatrician often asks me about feeding struggles because they’re just not trained to handle those issues. 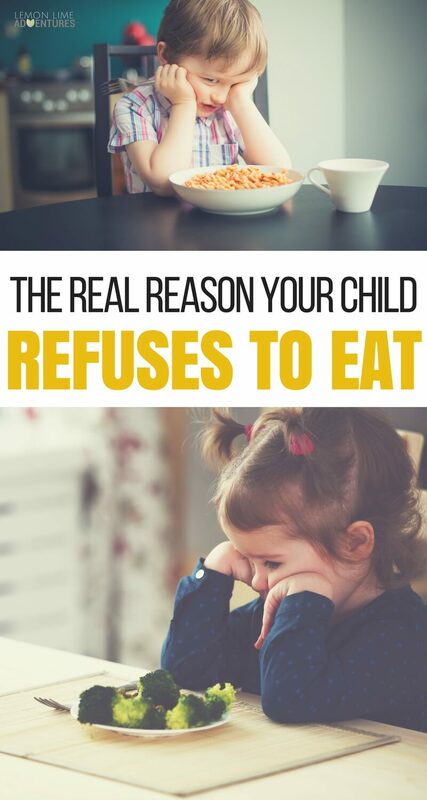 These five real reasons your child refuses to eat can apply to any child from the second that they start eating all the way through their teenage years. No matter how old your child is, you can find out the real reason your child refuses to eat. I know that you Lemon Lime Adventures readers are very familiar with sensory preferences. If you aren’t, sensory preferences and eating overlap so strongly because eating is a very sensory experience. We decide what we’re going to eat based on our senses. Even us grown-ups, if you think about it, we decide what we’re going to eat based on how it looks, how it smells, how it feels, how it tastes. There’s no avoiding that eating is a very sensory-rich experience! There’s a huge amount of kids that are refusing to eat because they don’t like the way something looks, tastes, feels, or smells. Our kids that have some sensory needs that we already know about. We already know that we’ve seen in other areas that they tend to be sensory seekers or sensory avoiders. If you’re seeing those kinds of things with your kiddos, there’s a really high likelihood that their picky eating is caused by strong sensory preferences. 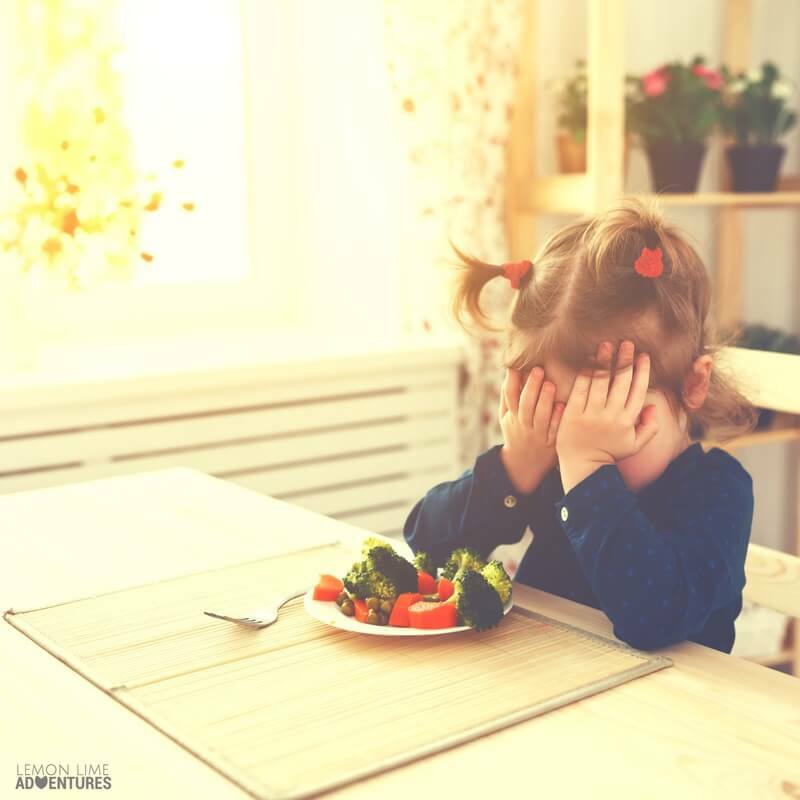 It’s really important to first always consider what is going on from the sensory angle when we’re trying to figure out why our kids refuse to eat. It really helps us be a little bit more patient and compassionate with our kids when we can understand that they’re not doing this to be bad. They’re not refusing to eat the chicken because they just don’t feel like eating it. It’s because it’s really physically uncomfortable to them. Think of a sensation that’s really uncomfortable to you, like nails on a chalkboard. Not many people can tolerate that because it’s super intense, and that piece of chicken on your kid’s plate could be doing the same thing to them. When they look at it, they can just imagine what it might feel like and they may start gagging right out of the gate. Gagging just at the sight of food is a major red flag that can tell you their picky eating may be caused by sensory preferences. The second reason your kids refuse to eat might surprise you. This is one that really doesn’t get talked about a lot. It’s actually your child’s ability to chew their food. As kids get older, we really take this for granted and assume that they can because chewing struggles are often more obvious in children that are really young. When babies are learning how to eat or as toddlers if they’re putting food into their mouth and they’re spitting it out or it falls out of their mouth, they probably don’t have the coordination and the strength that they need to be able to chew the food well. Our big, fancy therapy word for this is oral motor skills. That really is just referring to that strength and coordination they need to chew. If kids don’t get the help with this when they need it, it can snowball into something bigger and even older kids may have never figured out how to really chew their food. When this happens, they just start avoiding eating altogether. If they are afraid they’re going to choke on it, if they don’t know how to move it around in their mouth, they’re really going to stick to the foods that they know. You’ll see kids that are doing this tend to prefer really soft foods that just slide right down their throat. They want to eat pudding and jello. On the flip side, sometimes they want to eat crunchy foods because it’s easier to move the crunchy food around in their mouth. They can feel it really well. It gives a nice crunching sound when they’re chewing. So if your kids are refusing to eat, start to pay attention to their oral motor skills. Once you start looking, you might be surprised! If your child is struggling to chew you might notice things like not seeing their mouth moving that much or food just falling out of their mouth. You might notice that they can’t move their tongue from side to side. All of those are all big indicators that they may need some more help with how they’re actually chewing their food. I’m starting this section with a disclaimer that this reason kids refuse to eat is much less common than the others. If you’re not seeing a sensory reason at all, and you’re not seeing that they’re having any problem chewing or moving the food around in their mouth, it’s really, really important to consider an underlying medical reason for their struggles. 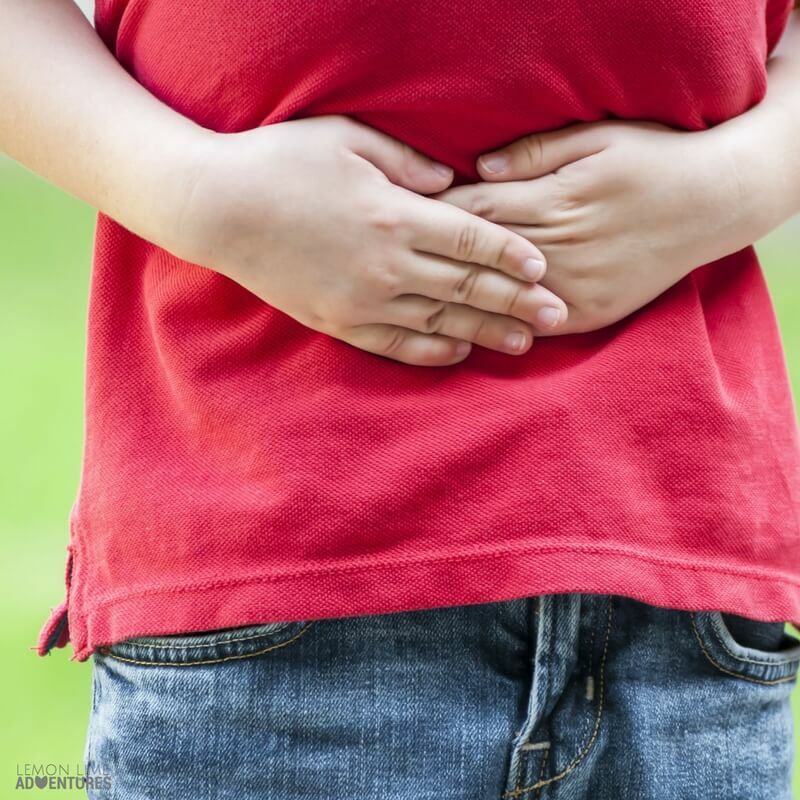 I can’t tell you, although it’s not at the top of the list, how many kids I’ve worked with at four, five, seven, 10 years old, have silent acid reflux that’s gone undiagnosed for years. These kids can’t describe the pain, because it’s a pain usually that they’ve always known. They don’t even realize that they’re in pain, but they instinctively know certain things make it worse. Eating is just uncomfortable, and sometimes downright painful, for these kids. Acid reflux is probably the most common, but there’s a whole host of other kinds of quirky, more unusual medical things that can be going on. If you’re working hard at helping your picky eater, you feel like you’ve gotten some good strategies in place, you’ve ruled out these other possibilities for a reason, and nothing seems to be making sense, I highly recommend talking to your doctor and really pushing to see a pediatric gastroenterologist. In most cases now, you can even call and set up that appointment yourself! Call around in your area, ask for referrals, ask your friends who they know that they have gone to, and look for a pediatric doctor that has been really responsive and helpful. As a therapist, this is something I do everyday, just like I’m doing in this post. I kind of go down this checklist and when I feel we’re hitting a wall, I start to ask myself these same questions. I tell families that they go consult the doctor to make sure nothing else is going on. Even if there aren’t blaring signs, make an appointment just to rule a medical issue out. So far we’ve covered sensory preferences, oral motor skills, medical reasons, and finally, we’ve reached the reason that’s actually probably the most common. It’s right up there with sensory preferences. This reason your kids refuse to eat is that they’ve reached the normal picky eating phase. I’m going to be honest here, the picky eating phase just totally stinks, but it is a totally normal part of development. Most of our kids hit this somewhere between the ages of one and two and they can stay in it until they’re three and a half to five years old. 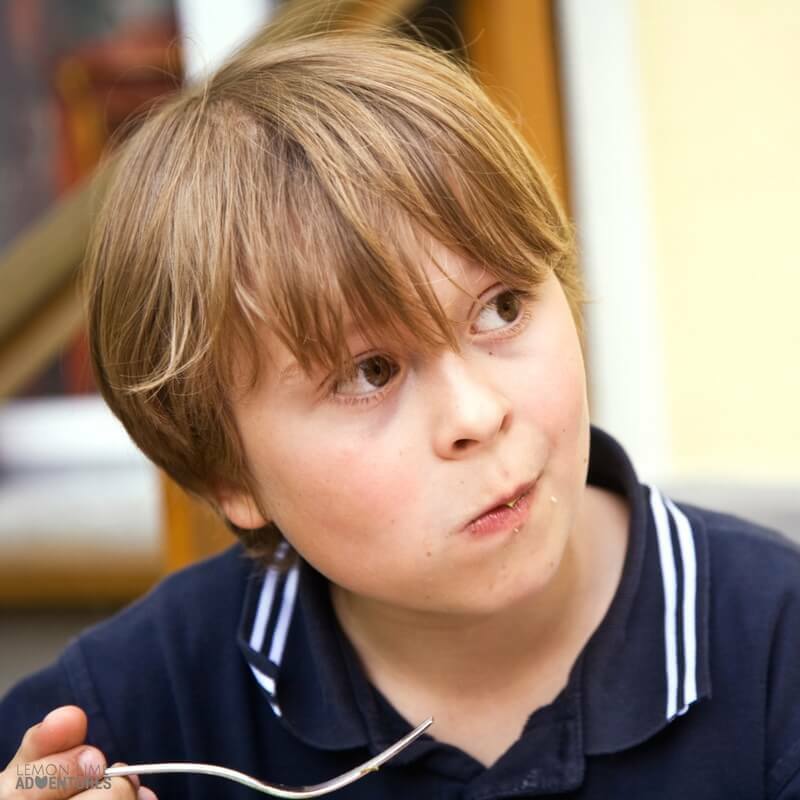 There’s a really clear distinction between what is normal picky eating, so that developmental phase that a lot of kids go through, and more extreme picky eating. If your child is in that age range, it’s probably at least a component of their picky eating. Most of our kids hit this somewhere between the ages of one and two and they can stay in it until they’re three to five years old. There’s a really clear distinction between what is the normal picky eating developmental phase, and more extreme picky eating. If your child is in this age range, though, it’s probably at least a component of their picky eating. I will tell you these kiddos usually just tend to be really particular about not liking vegetables. They may have some meats that they don’t like, but they’ll usually still eat a decent variety of foods. As parents, we usually all wish that our kids would eat more fruits and vegetables because that’s usually where these kids are struggling. They’re not the kids that are gagging when they come to the table. They are not the kids that will only eat chicken nuggets in 90-degree temperature from the McDonald’s drive-through. They are not the kids that have a meltdown if you accidentally bring the wrong flavor of cereal home. That’s not the average picky eating. That’s when we move into more extreme struggles and other reasons your kids refuse to eat are happening. 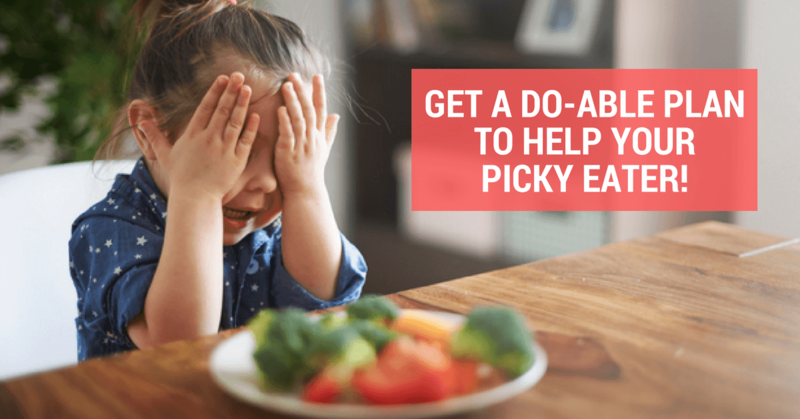 If your child is in the developmental stage of picky eating, you can take heart and know that if you’re staying the course and working hard with your child, and you’re keeping a good routine around meals, your child will likely grow out of it soon. It’s where their brain development is at too. They’re not at a place where they’re open to exploring new things in a lot of ways. I hear from parents, and I have seen with my other two children, that once they hit five, all of a sudden they’re eating. It’s a huge mental shift for them. It’s really because their brain is developing more, and they’re open to trying more and able to understand things better. If you’re finding yourself in that position, that’s probably because you’re facing one of the other reasons for picky eating. Sometimes when normal picky eating happens, it can snowball out of control too. As parents, we freak out, we start doing all kinds of crazy things, and sometimes we go down a rabbit hole and it can grow into something much bigger and our kids don’t come out of it. First I want to make this super duper clear. This is probably the smallest percentage, however, it is often a component of all other four reasons. That is behavioral. I will tell you that this is probably the thing that most people will probably say first. It’s probably one of the biggest myths about picky eating. The thing is, in all the research we know, this is such a small component of picky eating. Everybody wants to say that kids are just being bad when they’re not eating well or when they’re refusing. When they’re not coming to the table to eat, they’re being disobedient. 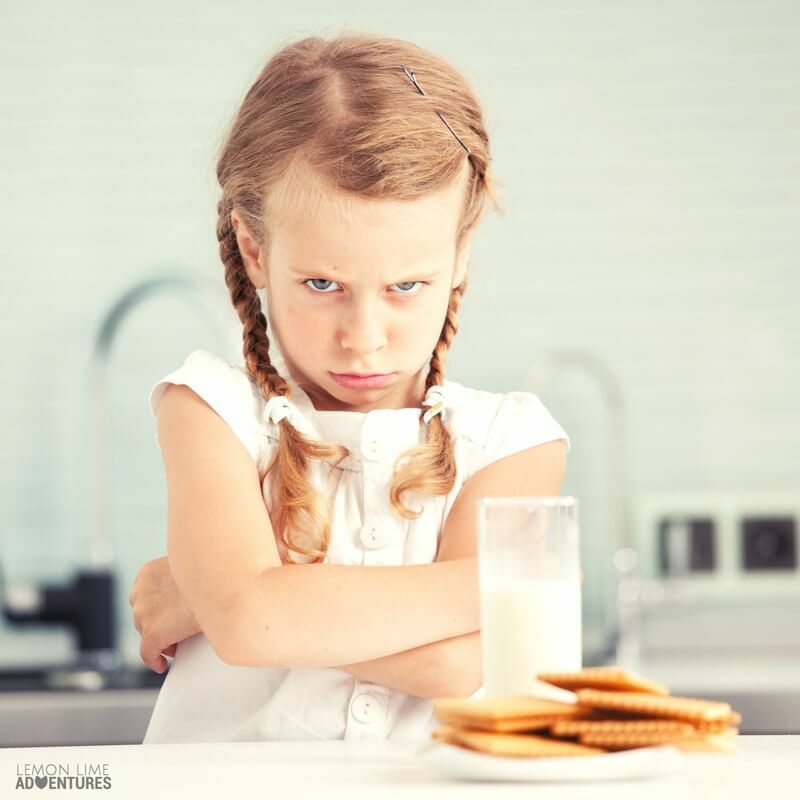 The main reason that picky eating turns behavioral is that this is one of the areas in their life that they can control. They can control sleep and they can control eating. If a child wants to get some control in their life, this is one of the first they’re going to go to get it. I want you guys to be very careful, though, because we hear about picky eating being behavior so much. We hear it from other generations, the medical community, and more. It’s important that parents have a mental shift and realize it’s a little bit more than them just being bad. Behavior can certainly be a component, but I don’t think I have ever treated a child in the hundreds of children that I have worked with that it was solely behavioral. There has always been something else going on at the same time. I have got you completely covered because my friend, Alisha from Your Kids Table, has a brand new picky eating workshop! I am so excited about this because Alisha is going to be walking through with you guys step by step to help you truly understand and help your picky eater! You can learn Alisha’s best strategies for helping your picky eater during this workshop, and I know it’ll be a game-changer for your family! I don’t want you doing anything else until you’re doing these five things. The strategies you learn during the picky eating workshop are going to work just as well for the 14-month old that’s not eating, for the five or the 10 or the 12-year old that’s not eating well, for the child that has three foods or for the child that you want to have an enjoyable meal with because it’s a stressful time for you. All of those eating struggles and everything in between is what this picky eating workshop is for. It’s really about figuring out a plan and she’s going to tell you exactly what the plan is and how to make it work in your home. Whatever combination of the reasons that we talked about today, those five strategies are going to be the first steps for you take in helping your child come out of that and deal with some of the challenges that they’re facing. You can sign up for the picky eating workshop here! I am so excited with the challenge! Challenge accepted….